The classical Broadway musical The Sound of Music will come to Beijing at Beijing Exhibition Theater from Dec.10th to Dec.14,2014. The Sound of Music (1959) is a musical with music by Richard Rodgers, lyrics by Oscar Hammerstein II and a book by Howard Lindsay and Russel Crouse. It is based on the memoir of Maria von Trapp, The Story of the Trapp Family Singers. 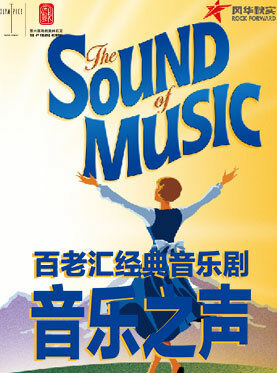 Many songs from the musical have become standards, such as “Edelweiss”, “My Favorite Things”, “Climb Ev’ry Mountain”, “Do-Re-Mi”, and the title song “The Sound of Music”. The original Broadway production, starring Mary Martin and Theodore Bikel, opened on November 16, 1959; the original London production opened at The Palace Theatre on May 18, 1961 starring Jean Bayless and Roger Dann. The show has enjoyed numerous productions and revivals since then. It was adapted as a 1965 film musical starring Julie Andrews and Christopher Plummer, which won five Academy Awards. The Sound of Music was the final musical written by Rodgers and Hammerstein; Hammerstein died of cancer nine months after the Broadway premiere.